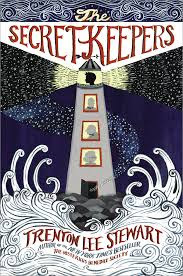 Did you miss my review of The Secret Keepers, the new title from Trenton Lee Stewart? If you did, go read it. Once you've read it you will understand why it is that you want to read this book. I am very happy to announce that Little Brown Books for Young Readers has offered to give away one copy of The Secret Keepers to one of you! Would you care to win? (Of course, of course!) Simply leave a comment below. Must be a U.S. Resident to win. Make certain to leave a valid e-mail address in the comment section so that I can contact you should your name be selected as the winner. This contest will be open through Monday, October 3rd. Best to you! Many thanks to LB Kids for their generosity! And many thanks to them for publishing this title in the first place! THIS CONTEST IS NOW CLOSED. THE WINNER, as selected by Random.org, is #4 - Beth! CONGRATS! Oh, Carrie! I am glad that you liked the book, and am looking forward to reading it myself. Do you have a long hold list on your copy? :) Because I know I want to borrow it! It was good to see you all at church after over two long months. This sounds like a must read for us. Definitely need to add it to our list, whether we win it or not. The book sounds wonderful. I already know that we like his other books. I enjoy your blog.